The tolerability and efficacy of single dose albendazole (400 mg), diethylcarbamazine citrate (DEC) (6 mg/kg bodyweight) or co-administration of albendazole (400 mg) + DEC (6 mg/kg bodyweight) was studied in 54 asymptomatic Wuchereria bancrofti microfilaraemic volunteers in a double blind hospital-based clinical study. There was no significant difference in the overall incidence of adverse reactions between the three drug groups [42.1% (albendazole), 52.9% (DEC) and 61.1% (albendazole + DEC); P > 0.05]. The mean score of adverse reaction intensity did not differ significantly between the DEC and albendazole + DEC groups. However, the values in these two groups were significantly higher compared to that of albendazole alone [1.8 ± 3.0 (albendazole) vs. 5.6 ± 7.1 (DEC), 6.7 ± 6.6 (albendazole + DEC); P < 0.05]. 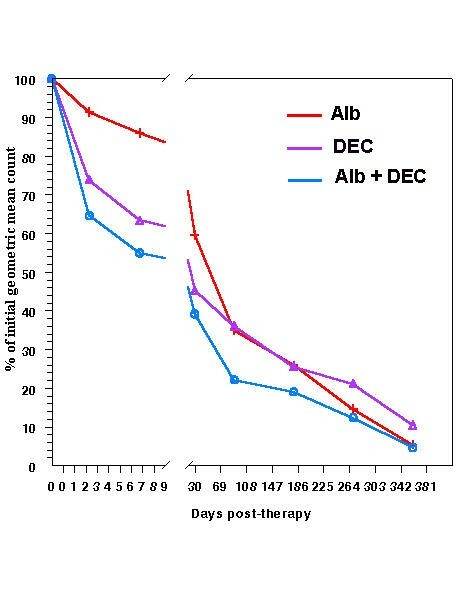 By day 360 post-therapy there was no significant difference between the three drug groups in relation to the clearance of microfilaria [26.3% (albendazole), 17.6% (DEC), 27.8% (albendazole + DEC)], reduction in geometric mean parasite density [94.7% (albendazole), 89.5% (DEC), 95.4% (albendazole + DEC)] or reduction in filarial antigenaemia [83% (albendazole), 87% (DEC), 75% (albendazole + DEC)]. Furthermore, there was a significant decrease in mean geometric parasite density (P < 0.05) as well as antigenaemia optical density values (P < 0.01) between pre-therapy levels and day 360 post-therapy in all three groups. This study has shown that single dose albendazole (400 mg) has similar efficacy in the clearance of microfilaria as that of DEC or the co-administration of the two drugs. The results strengthen the rationale of using albendazole for mass annual single dose administration for the control of transmission of lymphatic filariasis. Lymphatic filariasis is endemic in as many as 80 countries and has been targeted for global elimination as a public health problem. Recently, the control and elimination programmes for this disease have undergone a paradigm shift from mass detection and selective treatment to repeated annual mass drug administration (MDA) in endemic communities and implementation units. Furthermore, the strategy of MDA has moved from a single dose regime of diethylcarbamazine citrate (DEC) to co-administration of albendazole with DEC in areas where onchocerciasis is not co-endemic . In India, a total of 553 million people live in areas endemic for lymphatic filariasis and there are approximately 21 million people with symptomatic filariasis and 27 million who have asymptomatic microfilaraemia [2, 3]. Apart from the National Filariasis Control Programme (NFCP), which currently covers about 40 million people at risk, pilot projects using single annual MDA with DEC alone or in combination with albendazole have been running since 1996 and currently cover about 50 million people at risk in different regions of India [4–6]. Although the tolerability and efficacy of single dose DEC or ivermectin has been established in both a hospital-based study  and community-based MDA [3, 4, 6, 7] for the treatment of bancroftian filariasis in India, no similar published data exists for either single dose albendazole, alone or in combination with DEC. For this reason, the present study was undertaken which examined the tolerability and efficacy of a single dose of albendazole (400 mg) compared with DEC (6 mg/kg bodyweight) or co-administration of albendazole (400 mg) + DEC (6 mg/kg bodyweight). Fifty four 'healthy' asymptomatic microfilaraemic volunteers between the ages of 10 and 57 years (mean = 24.67), who had previously been selected by use of an inclusion/exclusion criteria (Table 1), and who had given written informed consent (see note), were admitted to the Government General Hospital at Pondicherry for a period of five days and randomly allocated into one of three single dose drug groups (Table 2). f) Declared unfit by physician for any other reason. a m = male, f = femaleb Alb = albendazole, DEC = diethylcarbamazine citrate c Geometric mean (range in parentheses): the pre-therapy values between the 3 drug groups did not differ significantly (F = 0.024, P = 0.976). On day 0, baseline clinical examination and laboratory investigations including night blood examination for microfilaria (mf) were carried out. The following morning, (Day 1), the appropriate drug regimen was administered to the patients on an empty stomach under the direct supervision of the medical team. All patients were clinically monitored for adverse reactions (such as fever, headache, myalgia, chill, abdominal pain, arthralgia, cough, diarrhoea, dizziness, nausea, vomiting and chest pain), at 8 hourly intervals for a period of 24 hours, and thereafter every 24 hours for a further 3 days. All systemic adverse reactions were recorded by assigning them a score of either 0 (none) or 1 (mild) or 2 (moderate) or 3 (severe). Laboratory tests (haemoglobin concentration, total white blood count, differential count, absolute eosinophil count, erythrocyte sedimentation rate, packed cell volume, blood urea, glucose, bilirubin, creatinine, cholesterol, serum sodium, potassium, chloride, protein, albumin, globulin, serum glutamic pyruvic transaminase, alkaline phosphatase) were carried out on days 0 and 7. A routine stool and urine analysis was included with the laboratory tests. Blood samples were collected on days 0, 3, 7, 30, 90, 180, 270 and 360, the serum separated and stored at -20°C until assay for circulating filarial antigen. Microfilaria counts were also performed on days 0, 3, 7, 30, 90, 180, 270 and 360. The study conformed to the principles of Helsinki Declaration II , the Guidelines for Good Clinical Practice (GCP) for Trials on Pharmaceutical Products  and the guidelines of the Indian Council of Medical Research for bio-medical research involving human subjects . Furthermore, the study was approved by the Institutional Scientific Advisory Committee and the Institutional Ethical Committee. The study was "blind" to the extent that patients, clinicians evaluating the adverse effects, and laboratory staff carrying out the laboratory tests and measuring mf and antigen levels, were unaware of the individual therapy schedules. Blinding and coding of the drugs was done by an independent monitor (a senior scientist who was not an investigator) after repacking in look-alike capsules by a pharmaceutical company in Pondicherry. The codes were broken only after completion of the study. Qualitative detection of circulating filarial antigen was determined by use of an immuno-chromatographic (ICT) card test (ICT Diagnostics, St. Balgowlah, Australia) on 50 μl of serum collected on days 0, 3, 7, 30, 90, 180, 270 and 360. Quantitative detection of circulating filarial antigen was determined by use of an Og4C3 ELISA test kit (M/S TropBio, Australia) on 50 μl of serum collected on days 0, 7 and 360. The relative tolerability of the three drug regimens was compared using the incidence and intensity score of the adverse reactions for a period of 4 days (96 hours) post-therapy. The incidence of adverse reactions in each group was calculated as the proportion of individuals complaining of any reaction up to, and including, day 4 post-therapy. The day-specific prevalence in each group was calculated as the proportion of individuals complaining of any reaction on the particular day of follow-up post-therapy. The total and day-specific mean reaction intensity scores were also calculated. The relative efficacy of the three drug regimens was compared using the clearance and density of microfilaraemia and antigenaemia among patients in the three drug groups. For this, the clearance (the proportion of patients who became amicrofilaraemic out of the total number of patients in a particular drug group) and proportion change in the geometric mean mf count in the three drug groups at different time points was compared with the pre-therapy levels. The day specific proportion positivity in the qualitative (ICT) and quantitative (Og4C3) antigenaemia tests was also calculated. The Chi-square test was used for comparing proportions (incidence of adverse reaction, antigen positivity) between the three drug groups. For comparing means (adverse reaction score), a non-parametric Mann-Whitney U-test was used. Microfilarial counts were logarithmically transformed and the Student's t-test was carried out for comparison of mean counts of mf and mean optical density values of Og4C3 test results between the drug groups. Correlation analysis was carried out to test any association between mf count and adverse reaction score. The age and gender class distribution of the 54 patients in the three drug groups is shown in Table 2. Pre-therapy mf counts in patients ranged from 22 to 606 per mL of venous blood, and the geometric mean pre-therapy mf levels between the three drug groups did not differ significantly (Table 2). The incidence of adverse reactions was 42.1% (albendazole), 52.9% (DEC) and 61.1% (albendazole + DEC) (Table 3). Fever, headache and myalgia were the predominant adverse reactions in all three drug groups. Adverse reactions in all the three drug groups were transient (not beyond 6 days) and only required symptomatic treatment in some cases. No life-threatening adverse reactions were observed in any of the patients. The incidence of adverse reactions was independent of age and gender (Table 4), and was highest on day 2 post-therapy in all three drug groups (Figures 1,2,3,4). The mean score of adverse reaction intensity (± SD) did not differ significantly between the DEC and albendazole + DEC groups (5.6 ± 7.1 vs. 6.7 ± 6.6; Z = 1.5; P = 0.165). However, the mean score for albendazole alone was significantly lower when compared to the DEC and albendazole + DEC groups (1.8 ± 3.0; Z = 2.1; P = < 0.05). The mean intensity of the three major specific adverse reactions (fever, headache and myalgia) also peaked on day 2 post-therapy in all three drug groups (Figures 5,6,7,8). 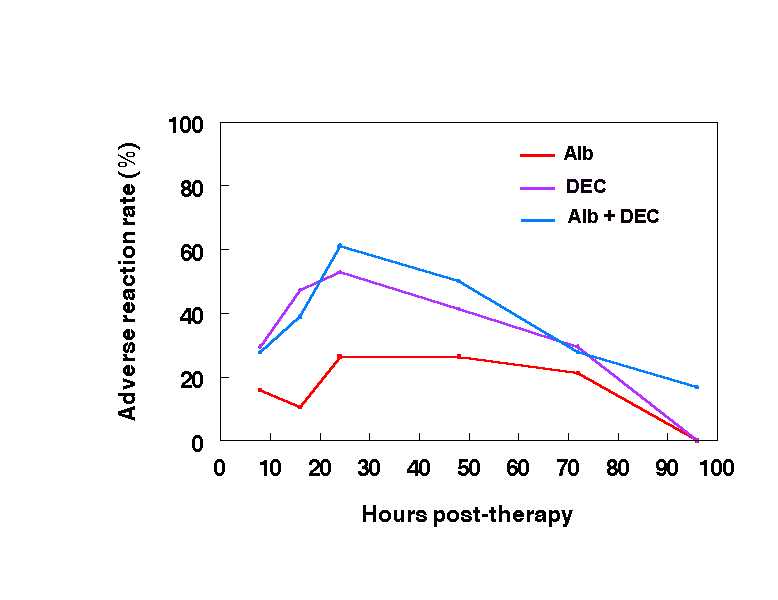 Overall incidence rate of adverse reactions in the three drug groups over the first 96 hours post-therapy (Alb: albendazole, DEC: diethylcarbamazine citrate, Alb + DEC: albendazole + diethylcarbamazine citrate). Fever incidence rate in the three drug groups over the first 96 hours post-therapy (Alb: albendazole, DEC: diethylcarbamazine citrate, Alb + DEC: albendazole + diethylcarbamazine citrate). 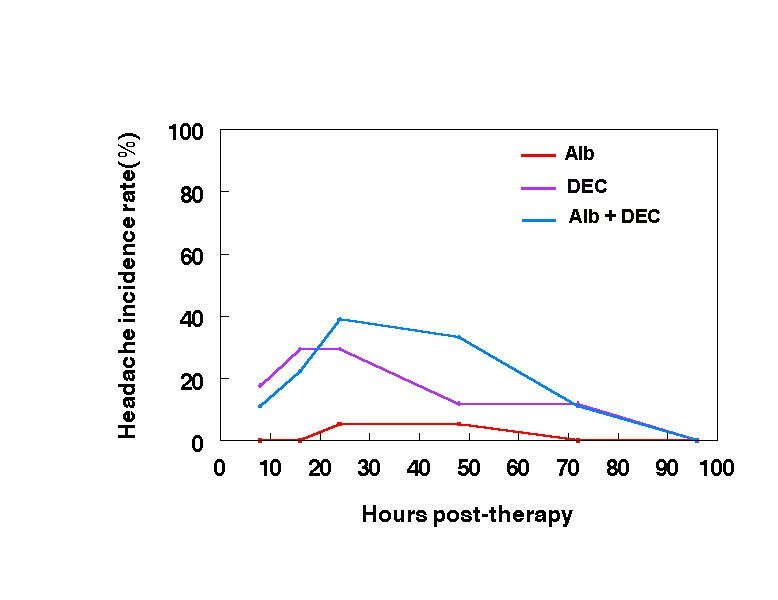 Headache incidence rate in the three drug groups over the first 96 hours post-therapy (Alb: albendazole, DEC: diethylcarbamazine citrate, Alb + DEC: albendazole + diethylcarbamazine citrate). 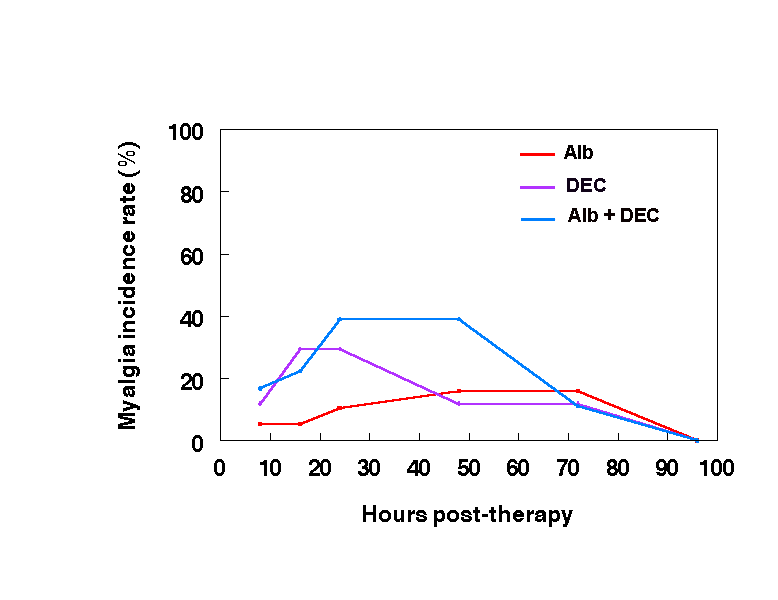 Myalgia incidence rate in the three drug groups over the first 96 hours post-therapy (Alb: albendazole, DEC: diethylcarbamazine citrate, Alb + DEC: albendazole + diethylcarbamazine citrate). 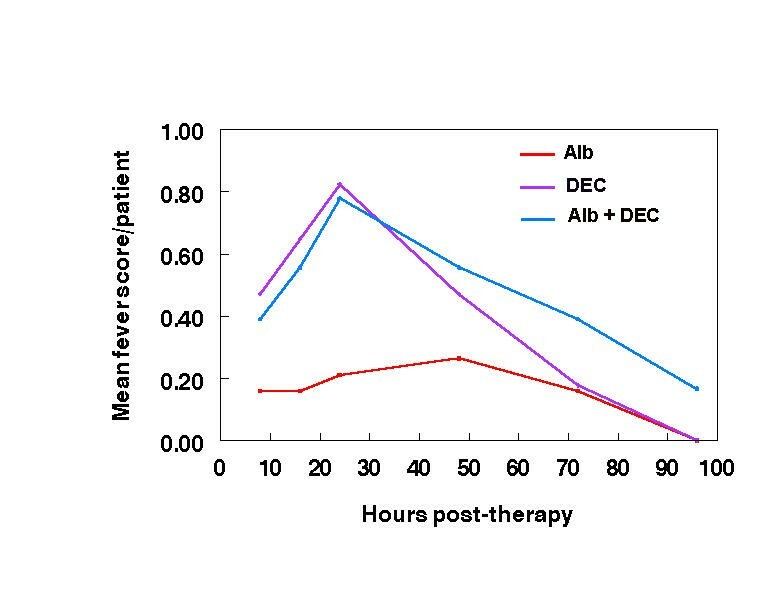 Overall mean score of adverse reactions in the three drug groups over the first 96 hours post-therapy (Alb: albendazole, DEC: diethylcarbamazine citrate, Alb + DEC: albendazole + diethylcarbamazine citrate). 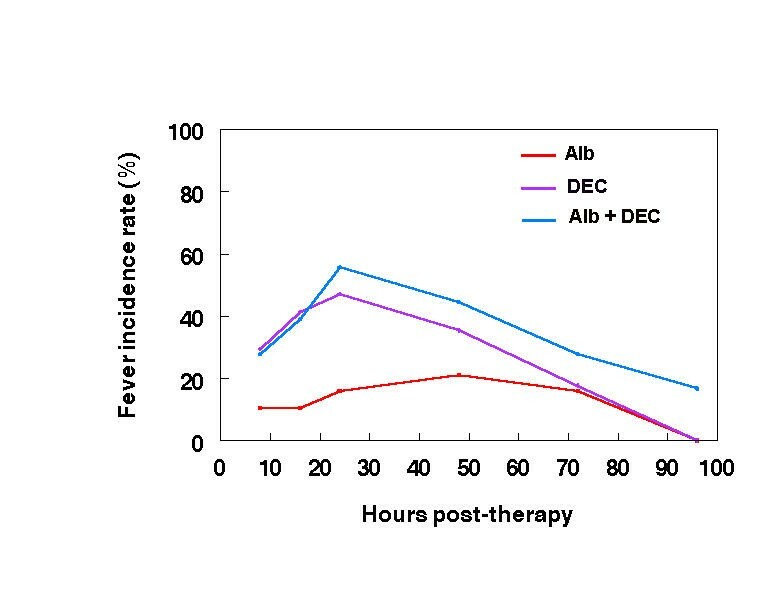 Mean reaction score of fever in the three drug groups over the first 96 hours post-therapy (Alb: albendazole, DEC: diethylcarbamazine citrate, Alb + DEC: albendazole + diethylcarbamazine citrate). 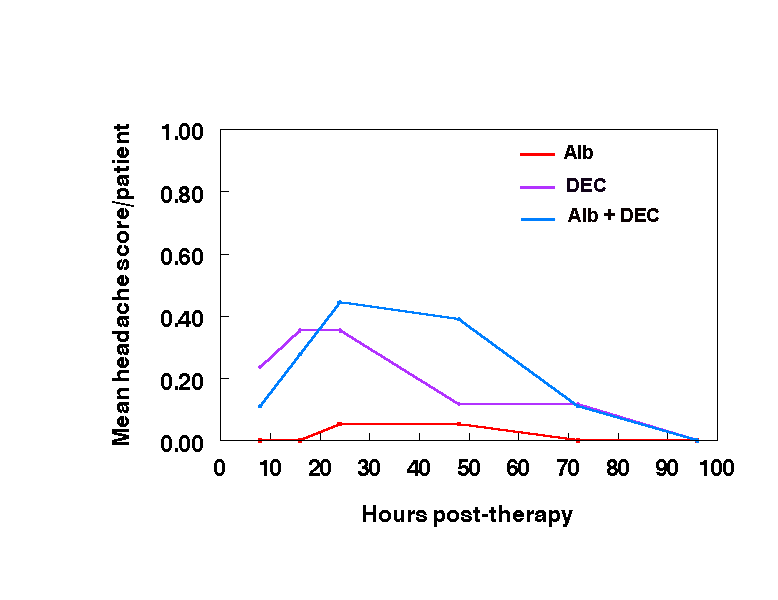 Mean reaction score of headache in the three drug groups over the first 96 hours post-therapy (Alb: albendazole, DEC: diethylcarbamazine citrate, Alb + DEC: albendazole + diethylcarbamazine citrate). 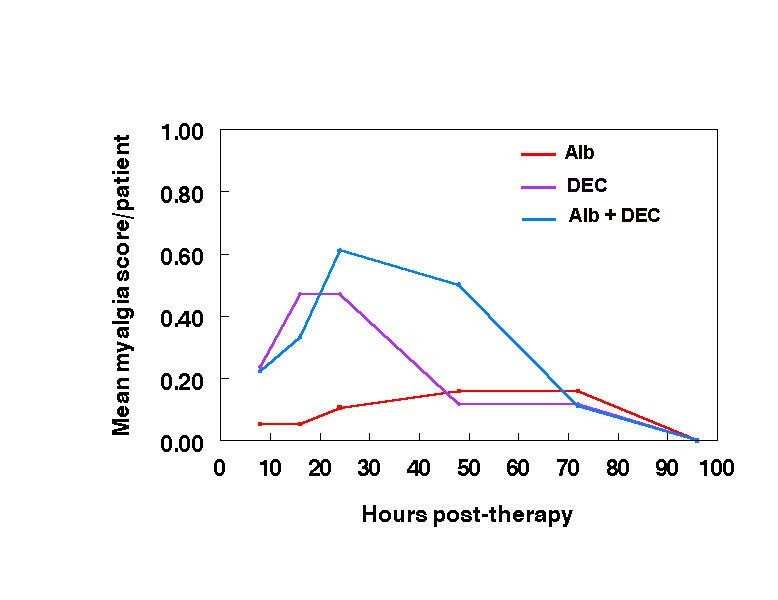 Mean reaction score of myalgia in the three drug groups over the first 96 hours post-therapy (Alb: albendazole, DEC: diethylcarbamazine citrate, Alb + DEC: albendazole + diethylcarbamazine citrate). Age and gender specific adverse reaction incidence (%) and mean intensity of score in the three drug groups. In the albendazole and the DEC groups, there was no significant correlation between the pre-therapy microfilarial count and adverse reaction scores [r = 0.10, t = 0.414; P = 0.684 (albendazole); r = 0.41, t = 1.76; P = 0.098 (DEC)]. There was however, a significant correlation between the pre-therapy microfilarial counts and overall adverse reaction scores in the albendazole + DEC group (r = 0.58, t = 2.81; P = 0.013) and between the three predominant adverse reactions [r = 0.56, t = 2.73; P = 0.015 (fever score); r = 0.62, t = 3.1; P = 0.006 (headache score); r = 0.51, t = 2.4; P = 0.029 (myalgia score)]. Haematological and biochemical parameters were within normal limits and did not change significantly between day 0 (pre-therapy) and day 7 post-therapy in any of the three drug groups (data not shown). None of the patients in any of the drug groups showed complete clearance of mf up to day 30 post-therapy. 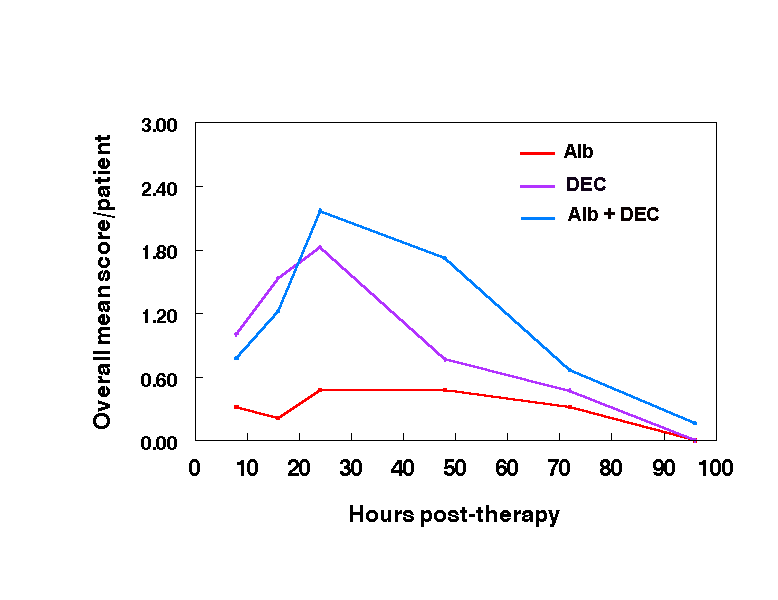 However, 5.3% of patients in the albendazole group became amicrofilaraemic by day 90 post-therapy compared with none in the DEC and albendazole + DEC drug groups. By day 360 post-therapy, the proportion of patients who became amicrofilaraemic was 26.3% (albendazole), 17.6% (DEC) and 27.8% (albendazole + DEC), and there was no significant difference between the drug groups (X2 = 0.58; P = 0.748) (Figure 9). Comparison of the pattern of mf positivity in the three drug groups on different days post-therapy (Alb: albendazole, DEC: diethylcarbamazine citrate, Alb + DEC: albendazole + diethylcarbamazine citrate). The geometric mean density of microfilaraemia on different days post-therapy was expressed as a percentage of the pre-therapy geometric mean in each drug group. On day 3 post-therapy, the geometric mean density was 91.3% (albendazole), 73.8% (DEC) and 64.3% (albendazole + DEC) of the pre-therapy levels. By day 7 post-therapy, these values had decreased to 85.9%, 63.3% and 54.9% respectively. 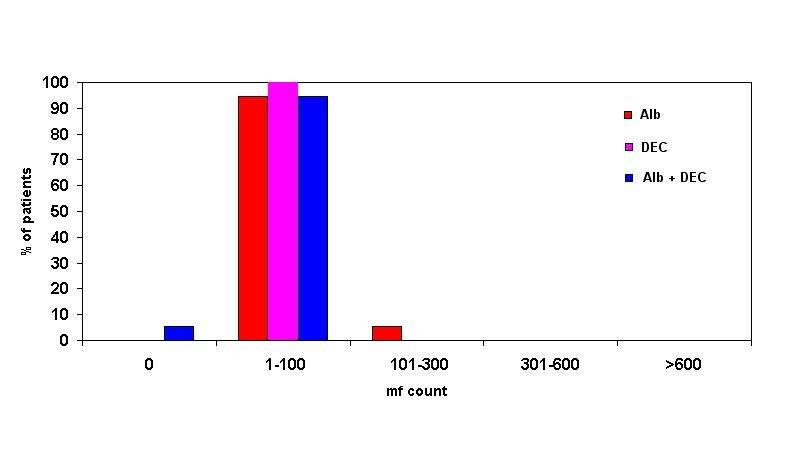 Considerable reduction in the density of mf was observed by day 90 and 180 post-therapy with the values (% pre-therapy) ranging from 19.0% to 34.9% in the different groups. By day 360 post-therapy, these values were 5.3% (albendazole), 10.4% (DEC) and 4.6% (albendazole) accounting for a significant reduction of 94.7%, 89.6% and 95.4% respectively (P < 0.05) (Figure 10). Although the geometric mean mf count for the albendazole + DEC group was relatively lower at all time points post-therapy (particularly marked in the early post-therapy period), it did not vary significantly between the three drug groups at any time point (P > 0.05). Percentage change in the geometric mean mf density in the three drug groups compared to pre-therapy level at different days post-therapy (Alb: albendazole, DEC: diethylcarbamazine citrate, Alb + DEC: albendazole + diethylcarbamazine citrate). 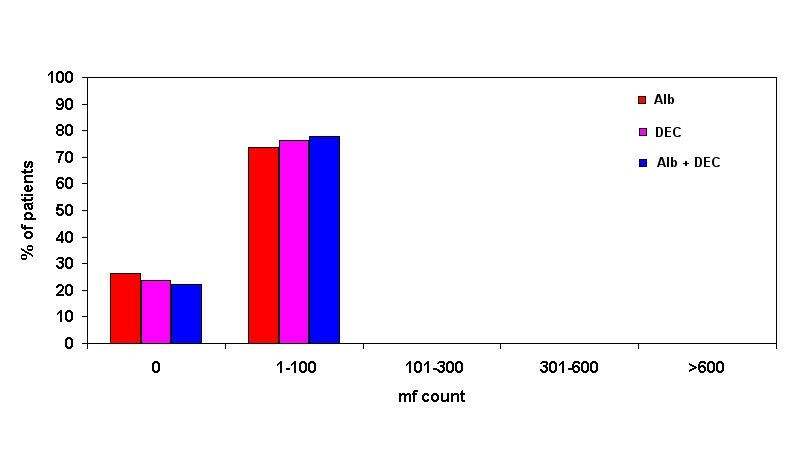 The relative changes in the frequency distribution of patients with different mf counts on day 0 (pre-therapy) and day 180 and 360 post-therapy in the three drug groups are shown in Figures 11,12,13. The pattern of change shows a shift of high-count individuals to low or zero count (moving from right-sided tail of the distribution to left) over time which is similar in all three drug groups. There was no significant difference (P > 0.05) in the mean mf counts either between gender or age classes at either day 0 or at day 360 post-therapy in the three drug groups. 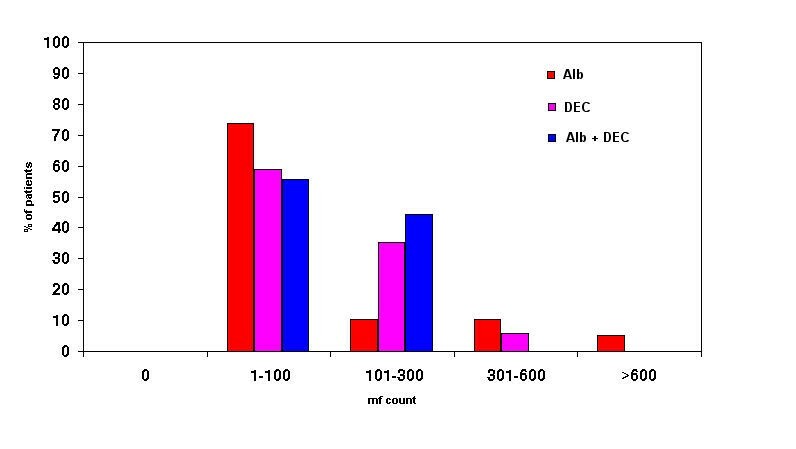 Pattern of distribution of microfilaraemic patients according to pre-therapy mf counts in the three drug groups (Alb: albendazole, DEC: diethylcarbamazine citrate, Alb + DEC: albendazole + diethylcarbamazine citrate). Pattern of distribution of microfilaraemic patients according to mf counts in the three drug groups on day 180 post-therapy (Alb: albendazole, DEC: diethylcarbamazine citrate, Alb + DEC: albendazole + diethylcarbamazine citrate). Pattern of distribution of microfilaraemic patients according to mf counts in the three drug groups on day 360 post-therapy (Alb: albendazole, DEC: diethylcarbamazine citrate, Alb + DEC: albendazole + diethylcarbamazine citrate). The prevalence of filarial antigenaemia in the different drug groups showed a gradual declining trend (Figure 14). The percentage reduction in the filarial antigen prevalence was 83% (albendazole), 87% (DEC) and 75% (albendazole + DEC) by day 360 post-therapy. Logistic regression analysis showed that antigen positivity was independent of the drug group during the period of observation (Wald statistics: 0.615; P = 0.735). The prevalence of antigenaemia did not differ significantly between the drug groups at any time point during the study (P > 0.05). Antigenaemia positivity rate by ICT in the three drug groups on different days post-therapy (Alb: albendazole, DEC: diethylcarbamazine citrate, Alb + DEC: albendazole + diethylcarbamazine citrate). Filarial antigenaemia prevalence as measured by Og4C3 assay showed a similar pattern to that of the ICT test prevalence by day 360 post-therapy. 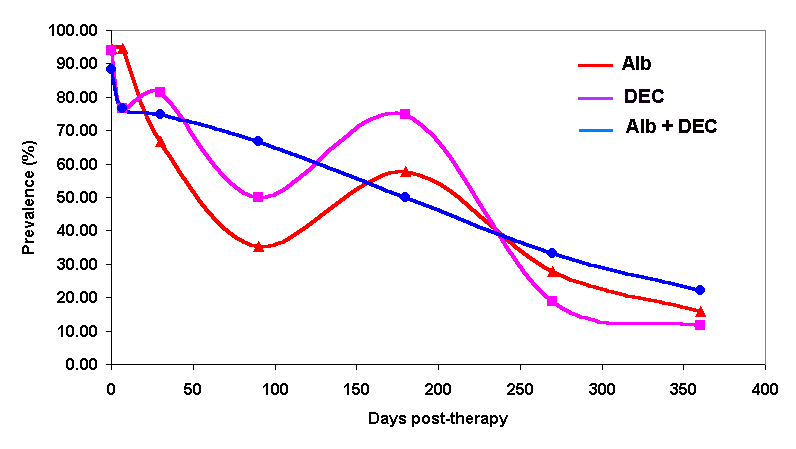 Og4C3 mean optical density (± SD) in all three drug groups was significantly reduced from day 0 (pre-therapy) levels by day 360 post-therapy [0.49 ± 0.16 vs. 0.08 ± 0.17, t = 7.62; P = < 0.0001 (albendazole); 0.39 ± 0.21 vs. 0.07 ± 0.15, t = 5.36; P = < 0.0001 (DEC); 0.47 ± 0.18 vs. 0.07 ± 0.15, t = 9.98; P = < 0.0001 (albendazole + DEC)] accounting for a percentage reduction in the filarial antigenaemia prevalence of 83% (albendazole), 80% (DEC) and 81% (albendazole + DEC) (Table 5). Day specific prevalence and intensity of Og4C3 in the three drug groups. This is the first report of a hospital-based clinical study on the comparative tolerability and efficacy of either a single dose of albendazole or its co-administration with DEC in Wuchereria bancrofti microfilaraemic patients in India. The study has clearly shown that single dose regimens of either albendazole, DEC or albendazole + DEC are well tolerated and efficacious. Although no individual patient in any of the drug groups showed complete clearance of microfilaraemia (i.e. 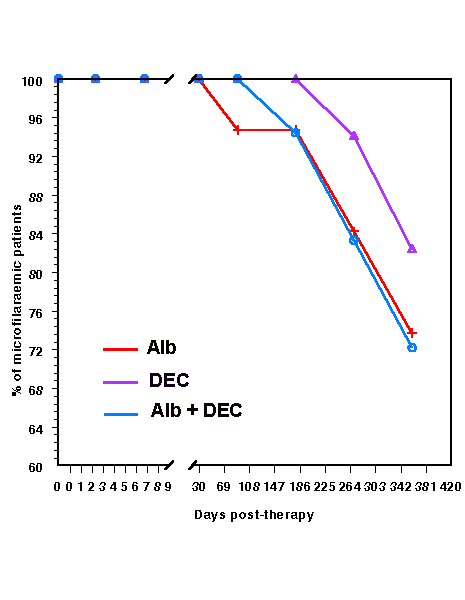 became amicrofilaremic) by day 30 post-therapy (Figure 9), the pattern of decline in mean microfilaria density (Figure 10) in the first seven days post-therapy revealed that either DEC alone or when co-administered with albendazole resulted in a relatively rapid decline when compared to albendazole alone. The faster decline of mean microfilaria density in the DEC and albendazole + DEC groups also correlated with the higher mean score of adverse reaction intensity as compared to albendazole alone. The delayed reduction in mf density due to albendazole alone suggests a different mode of action of this drug, either by damage or sterilization of the adult worm. The difference in the pattern of change in mf density in the first week post-therapy between the three drug groups could explain the difference in the adverse reactions incidence rate. For example in the albendazole group the change in mf density was minimal as also the adverse reaction incidence. The decline in prevalence of antigenaemia was relatively gradual compared to the decline in microfilaraemia prevalence by day 360 post-therapy (about one year) in all three drug groups. Comparison of the results of the current study, (particularly with regard to efficacy of albendazole alone or when co-administered with DEC), with previously published data [12–15] revealed that there is a broad agreement in the trend of decline in microfilaria prevalence and density across the studies (although the time points of follow-up and dosage of albendazole were different). However, this study demonstrated the highest level of decline in mf prevalence compared to pre-therapy values, after a one-year follow-up, than similar previous studies (Table 6). Comparison of the efficacy of albendazole alone or with DEC in the current study with data published previously. Annual mass administration of single dose anti-filarial drugs to entire endemic communities for the control of transmission of lymphatic filariasis is currently the recommended strategy for the Global Alliance for the Elimination of Lymphatic Filariasis (GAELF) [1, 3–6]. The World Health Organization (WHO) has set the target for global elimination of lymphatic filariasis by the year 2020  and India, which has roughly 40% of the global burden, has set its target for national elimination by the year 2015 . The realization of these goals will largely depend on the use of safe, tolerable and efficacious single dose drug regimens, which will not only improve community acceptance, compliance and coverage of mass drug administrations, but also decrease costs by simplifying drug distribution. The results of the current and previous studies [12–15],[17, 18] strengthen the rationale of including albendazole with either DEC or ivermectin for mass annual single dose administration by the GAELF (particularly for Wuchereria bancrofti, which accounts for over 90% of the global burden of lymphatic filariasis). Of all the anti-filarial drugs, single dose albendazole (400 mg) is safest, as it produces the least adverse reactions in microfilaria carriers. Therefore, it is expected to be widely accepted by the population in endemic communities, even when the prevalence of infection and parasite density is high . Furthermore, albendazole (unlike DEC) is safe for mass administration in countries and regions where lymphatic filariasis is co-endemic with onchocerciasis and/or loiasis . The efficacy of single dose albendazole (400 mg) in terms of reduction in microfilaria density at the end of one year (particularly considering its use in endemic communities in cycles of one year) is equal to DEC alone or it's co-administration with DEC.
As well as being safe, tolerable and efficacious, albendazole has significant "beyond filariasis" benefits when compared to other anti-filarial drugs . It has a broad-spectrum effect on intestinal helminths (and some protozoan parasites) and, consequently, improves nutritional status and cognitive functions, particularly in children. This will be of particular importance in countries, such as India, where specific nutrition supplementation programmes are being implemented by the national government , and where the benefit of such programmes is expected to be low because of the high prevalence of intestinal parasites in the population [20, 21]. Furthermore, GlaxoSmithKline has generously committed itself to the donation of albendazole to all countries endemic for lymphatic filariasis for as long as it is needed . Therefore, as far as albendazole is concerned, the cost or affordability to an endemic country's national programme is not important. WHO currently recommends mass annual single dose co-administration of albendazole with DEC (in countries where onchocerciasis or loiasis is not co-endemic) or with ivermectin (in countries where onchocerciasis or loiasis is co-endemic) . This recommendation is based on the findings of previous hospital-based clinical trials [1, 18]. Furthermore, a recent community-based trial in India, showed that co-administration of two anti-filarial drugs, (particularly DEC and ivermectin), could result in a rapid and sustained reduction in parasite density, when compared to administration of the drugs individually . In other communicable diseases such as leprosy and tuberculosis, multi-drug regimens are used for the treatment of individual patients with a view of preventing drug resistance [23, 24]. Unlike the mycobacterium pathogens which cause leprosy and tuberculosis, there are no reports of lymphatic filarial parasites developing resistance to anti-filarial drugs. DEC, in particular, has been in use for almost five decades without any evidence of development of resistance . Although variability in the sensitivity to albendazole by intestinal parasites from different regions of the world has been reported , a recent study using a genetic marker, (for the β-tubulin gene), has shown that strains of Wuchereria bancrofti from different parts of India are sensitive to benzimidazole compounds . However, in view of the fact that mass annual single dose drug administration will have to be carried out for a number of annual cycles (for a decade or more if necessary) and that the three key drugs for the control of lymphatic filariasis, namely, albendazole, DEC and ivermectin are known to have different mechanisms of action on lymphatic filarial parasites , it may be prudent to co-administer two drugs (albendazole with DEC or ivermectin [depending on whether the region is co-endemic for onchocerciasis and/or loiasis]), so that the possibility of selection of filarial parasites with lowered sensitivity to any one single anti-filarial drug is prevented . In spite of this generalization, it should be understood that the choice of drug for a particular region could depend on other local factors such as degree of endemicity. For example, in areas with high endemicity and high mean parasite density, albendazole alone could be the drug of choice for the first few rounds of MDA, (before co-administration with another anti-filarial drug is implemented), as community acceptance and compliance will be high due to the lower adverse reactions seen with albendazole. The current study was carried out using relatively small numbers of asymptomatic Wuchereria bancrofti microfilaraemic volunteers from South India. Therefore, the results of this study should not be generalized for all endemic areas. Further data needs to be generated from both multi-centre hospital- and community-based studies in different settings within India and other endemic countries, to build further the evidence base for achieving the goal of global elimination of lymphatic filariasis. In the case of children who were ≤ 12 years old, written informed consent was given by their parents. All children who where > 12 years gave written informed consent for themselves and their parents were also fully informed and agreed to the participation of the child in the study. The authors would like to thank Dr Vijayan, Mrs. K.Vijayalakshmi for their technical assistance and Mr. Palaniswamy of Caplin Laboratories ltd. for re-packing the drugs used in this study. The study was funded by the Indian Council of Medical Research, New Delhi. Author 1, SPP, developed the study concept, and was involved in the design and implementation of the study as well as manuscript preparation. Author 2, GSR, carried out the clinical evaluation in relation to the study of tolerability and efficacy. Author 3, LKD carried out the case detection and recruitment, manuscript preparation. Author 4, PV, carried out the data analysis and statistical analysis. Author 5, SLH, carried out the antigenaemia aspects of the study. Author 6, JR, assisted GSR in clinical evaluation and organizing the haematological and biochemical laboratory tests. Author 7, PKD, developed the study concept, interpretation of results and provided technical and administrative support.